2. Open the Office 365 OWA email signature editor, navigate to the part where you want to insert the image and press Ctrl+V on your keyboard. After the image is inserted, you can scale it by choosing one of the options provided in the sub-menu when you click on the image (Fig. 2). Fig. 2. An image pasted into the Office 365 OWA email signature editor. NOTE: There is no known limit for the number of images in an Office 365 email signature. HYPERLINKED IMAGE: To add a hyperlink to an image, highlight the image (you know that it has been highlighted when a bluish shadow appears on it; the same way as you highlight text), click the Insert Hyperlink icon (Fig. 3) and in the resulting window type the hyperlink URL. Fig. 3. Insert Hyperlink button in Office 365 OWA. 3. Click the save button at the top of the Office 365 OWA settings panel. Fig. 4. A signature with an image in Office 365 OWA. Fig. 5. A signature with image in email sent from Office 365 OWA. When you apply the above solution, what you effectively get is a so called ‘linked image’. The problem with linked images is that they tend to get blocked by popular email clients. Go to my Images in email signatures – linked or embedded? article to learn more about the pros and cons of using them. non-IT staff can manage email signatures without access to Office 365 Admin Panel. I have been trying so many other recommendations which did not work well. This is so simple and it got the job done. Thank you! My problem is occurring when I access 365 from the internet rather than through outlook. Do you have any suggestions? Please provide more details about the problem, i.e. what you want to achieve and what actions you are performing. I have my image as a .jpg, but I don’t know how to upload the image to the web? I don’t yet have a website. Is there any more information that you can share that would help me get my logo into office 365 email signature? Try uploading the image to your OneDrive account as per this article: https://support.office.com/en-us/article/Upload-photos-and-files-b00ad3fe-6643-4b16-9212-de00ef02b586. Next, get a link to this image that doesn’t require sign-in and never expires: https://support.office.com/en-us/article/Share-documents-or-folders-in-Office-365-1fe37332-0f9a-4719-970e-d2578da4941c. Finally, open this link in a browser and proceed as per my article. I have used this technique for creating images in my signature, but have found that certain mail servers do not accept the images and instead display them as a string of the URLs where the images are hosted. This is at least what I see in the replies to said emails. They also sometimes come back as attachments, or with the file name next to the image. Is this because the reply was a plain text email? Is there a way around this so it does not look so clunky? Please let me know as soon as you can. Thanks! That’s a good question. One reason could be a general problem with email clients not downloading linked images. The only solution in this case is to use software that supports embedded images. I’ll actually add a link to some more information at the bottom of the article, because I think it’s important. Unfortunately, if the reply is a plain text email, even embedding images won’t help. The reply will just dump them in the attachment space. Regarding Step 1 – How do I load an image to a website? Pretty basic, I know, but I can’t get past the first step. First you have to decide where you want to load the image. If it’s going to be your own website, I recommend asking your webmaster for assistance. If you decide to use a free online image hosting service like imgur.com, tynypic.com, imageshack.com, etc., just go to their ‘Help’ sections. They usually have videos and are pretty intuitive anyway. Keep in mind that WordPress also allows for uploading images: en.support.wordpress.com/images/. I have followed all the steps as shown above, and it just shows a little box with a question mark in?? I am using a Mac, will that make a difference? Sorry for the late reply. When do you see the box with question mark? When you paste the image in the Office 365 OWA signature editor or after you test sending an email that includes the signature? Im having trouble with a Mac to, when pasting the image into the email signature editor it just appears as Kate has said above, as a little box with a question mark. I have tried multiple browsers so must be a Mac thing, any ideas? Are you using the Paste as is option (see my suggestion above)? the mailuser can see the Picture with a url link on the rights side. I’m not sure if I understand – is the picture displayed correctly, but with an additional url on the right side? Can you upload a screenshot of this issue somewhere on the web and paste the link here? This would be very helpful. Also, please provide more details about the sender’s and recipient’s environments (OWA versions, Internet browser used, Windows, etc.). The OWA Version is the current Office 365. The IE is Version 11 with Windows 8.1. It seems that there is unnecessary html code included in the signature. Have you exactly followed steps in the article? Make sure that after you paste the image in the signature it is highlighted before adding a hyperlink. Also – try to test the image itself – add the image but do not add a hyperlink. Then send the message and check the result. I did all the steps, however, when I go back to my email and try to past, nothing happens. Any suggestions? I am accessing my email through a web browser and not outlook. Does that make a difference? My article is related to Office 365 email accounts accessed via a web browser – are you using an Office 365 email account? Also, can you provide the URL of the image you are trying to use? This way we can check if it’s publicly available. Other than that: Have you pasted the image in the OWA signature editor as per step 2? Are there any text elements in your email signature? If not please add anything (e.g. 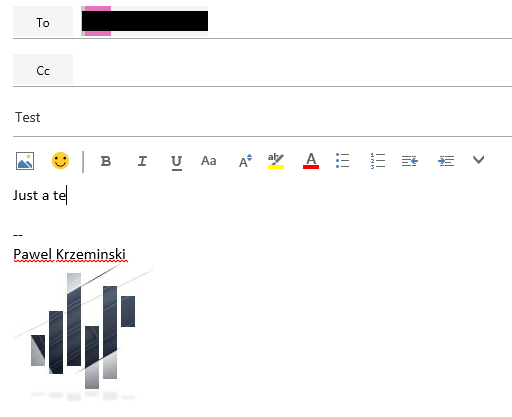 the word TEST) and check if the text is displayed in the signature section when you start composing a new email. Thanks for the great article. I did everything you instructed. I put my name, facebook link (image was copied from IMGUR) and my own logo. I saved the changed signature and then I wrote my first email, sent it to myself, and its blank with no signature? Could I email you a screen shot for help? 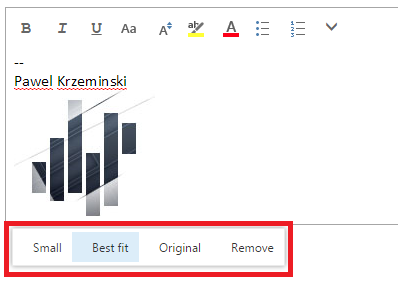 I’ve just tested this – it seems that now, after pasting the image in the Office 365 OWA signature editor (Options, Layout section, Email signature), you have to click the resulting CTRL context menu and select Paste as is. My signature image is stored in my OneDrive. Can it be linked from there? When I try ‘copy image’ from OneDrive and and then try ctrl + V in OWA signature editor nothing pastes in. I can paste in the link but that just shows as text. In OneDrive there is an option to share a link to an image publicly. You can do this via Share, Get link, Public (http://windows.microsoft.com/en-us/onedrive/share-file-folder). Next, go back to your image and select View original from the top menu. OneDrive will open the original image with the URL pointing to its location. Make sure the URL is accesible publicly (e.g. by opening it in a different browser) and then proceed as per my above instructions. Unfortunately, the Windows 8.x mail app does not yet support images (or any other rich text formatting). I am able to add images to my signature following your instructions. However, when someone receives the email it says, “To protect your privacy, some pictures in this message were not downloaded” and gives a button to download pictures. Is there a way to avoid this so the images show up without the recipient having to allow them to download? There’s nothing you can do on your end. Office 365 OWA does not yet support embedded images, which would display without the recipient’s intervention. Blocking linked images is standard behavior in many email clients. This setting can be in most cases easily changed on the recipient’s end: http://www.slipstick.com/outlook/email/microsoft-outlook-web-bugs-blocked-html-images/. Thank you so much! This is the only one that has actually worked for me! Very easy to following the directions and I was able to find everything you said and everything did what it was suppose to do! Thanks again! The procedure is not working for me, and I am even selecting “Paste as is” from the Ctrl context menu. The link just displays as plain text, both in the signature editor, and in the emails. Any ideas? I have tried all of the suggested options to insert a hosted image into my signature. All I get is the url, not the image. Are you sure you’re right-clicking the hosted image and choosing ‘Copy image’? Greg had a similar issue above and this turned out to be the solution. If this does not apply, can you paste your image’s URL here so I could test it? I’m having a problem with my email signature. I uploaded my company’s logo from the internet and paste it in the email signature space but when I send an email it only says : 1442386470899_PastedImage. What email clients are used on the sender’s and recipient’s side when the problem occurs? Also, does do you know what security/antivirus software is used by the recipient? When I uploaded the image into my email signature and I pressed save, then I went to new mail, the image turned into numbers similar to what Jenna and Katrina said. I’m sure we have the same problem. It has nothing to do with the antivirus that is used by the recipient or how to copy and paste the image. We need your help! 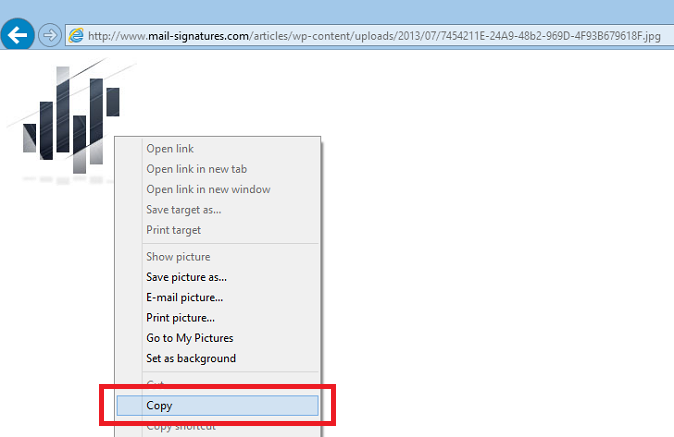 Can you check your Message format and Offline access settings (as per my comment: http://www.mail-signatures.com/articles/how-to-insert-images-into-office-365-email-signatures/#comment-10921)? Also, you said that you “uploaded” the image. Can you elaborate? Are you copying the image as per my guide or using a different method? I posted screenshots of my offline settings and the message format. Also, I copied and pasted the image into my email signature. Sorry about the confusion. I can’t view the images, please upload them to an image sharing service like photobucket. When I go to type a new email, the picture is no longer there and it shows numbers and says PastedImage. I believe that I have the same problem as Dany. Please help! Thanks! 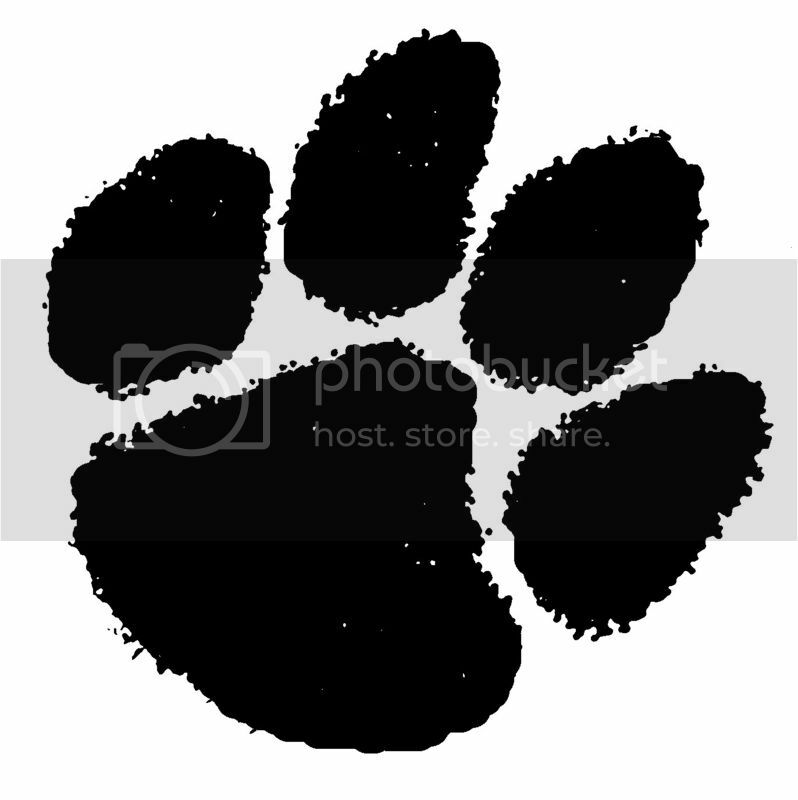 Make sure you are copying the full version of the image: http://img.photobucket.com/albums/v307/j_lashea/paw.jpg~original (right-click and select Copy image/picture). Also, keep in mind that many email clients by default block linked images. In these cases the recipient has to press a ‘download images’ button to have them displayed (e.g. : https://support.google.com/mail/answer/145919?hl=en). I’ve done exactly what you suggest here plenty of times, but for some reason the images only appear for a few emails, and then afterwards it reverts back to the name of the file, or the URL of the file in the block where the picture would be. It keeps happening too. The test run would go smoothly, but for some reason after a while all you see is the boxes mentioned above or a small box with a red x on it or a small box with the “photo icon” in it. What is your Message format setting in OWA? To check it go to Gear button, Options, Layout, Message format. Also, please let me know what your Offline access (https://support.office.com/en-us/article/Using-Outlook-Web-App-offline-3214839c-0604-4162-8a97-6856b4c27b36) setting is when the problem occurs. It won’t work in Google Chrome. Just internet explorer. Google chrome is what gives you the “pastedimage” error. I’ve just tested this on Internet Explorer, Chrome and Firefox, and I can confirm that the solution does not work on Chrome. IE and FF are both fine. Will add this info to the article. Wow – so simple! Thank you for sharing. Any idea how to add multiple signatures to the account (just as Outlook offers)? Multiple email signatures are not supported within OWA. To get them for an Office 365 account, you would have to use a standalone email client (like Outlook) or your company would have to deploy a central email signature management system, that somehow supports multiple email signatures for end-users (like Office 365’s native mail flow rules: http://www.mail-signatures.com/articles/configuring-organization-wide-email-signatures-in-office-365/ or CodeTwo Email Signatures for Office 365: http://www.codetwo.com/email-signatures/beta-signup/?sts=3037). Hi – have been trying to do this and get as far as adding the picture to my email signature, but when I try and add a hyperlink to the image, it doesn’t work and just adds the link as text next to the image. Help! Am losing the will to live!! Are you using Chrome? This solution was tested to work only on Firefox and Internet Explorer. I have tested the image signature on IE as well and it is behaving the same. First time the signature works fine but next time if you come onto signature page, the image is converted into Numbersxxxxxx_PastedImage and hence the signature for new message changes to numberxxxxx_PastedImage as well. Hence it is unlikely a browser level issue but there seems to be some glitch at Office 365 level. Hi Umar, Which IE version are you using? I have tried uploading the image using different upload website. 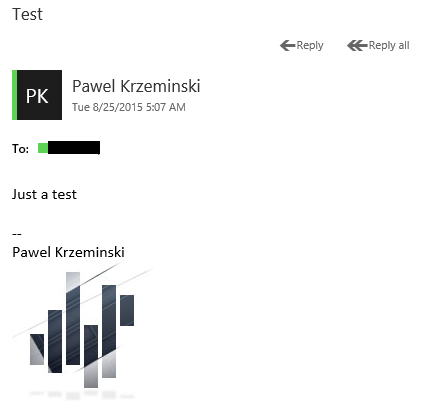 After I saved the image in my email signature, it only shows when I compose the message, but it disappear when the test emails are received. Here is the example. How can I get this fix? Can you check for test purposes if the problem is present when you use the below image? If it does, try applying the solution from this forum thread: https://community.office365.com/en-us/f/158/p/216264/662578#662578. I’m guessing that you’re sending the test messages to yourself, so it’s strange that you would be forced to add your address as safe, but it’s worth to give it a try. I’ve done as you recommended but my image will only show when I hit “reply” to an email. When I create a new email, there’s no image. How can that be possible? Is the ‘Automatically include my signature on new messages I compose’ option in your OWA email signature editor enabled and working, i.e. do text parts of the signature show when you create a new email? Also, what Internet browser are you using? Thank you for the response. OWA email signature editor is enabled and working. Yes the text parts of the signature show when I create a new email. I’m using IE not Chrome. All of the above is/has been confirmed…it’s only my computer. Hello I’m using a Mac. I can insert the image / graphic but no mater what I do – I do not get the graphic editor as outlined in the article here. If i use the standard outlook insert URL or alternative text function – the graphic will be replaced with the url I typed in. – I have used all sorts of graphic files, gif, jpg, png… no difference. – Any suggestion? – I hope its not a limitation on the mac office 365 implementation. As far as I know, the only way to add an image to an Outlook for Mac email signature is to drag it from an outside source and drop into the editor. 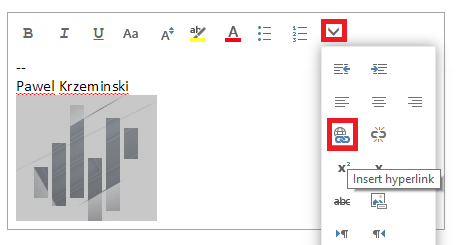 Is it possible to resize images in the signature section of office 365? This used to be a feature and we used it to successfully add company logos however it has since stopped working and now we have the basic resize options none of which give the size we want. It used to be that the image had grab corners. I have been in touch with Microsoft about this issue but there wasn’t really an outcome. I have opened in outlook and through 2 different browsers (chrome and explorer) with no success. Looks like it isn’t anymore. What’s left is to resize images outside of the OWA editor (e.g. in Paint) and only then upload into the signature. It works in some emails like Comcast – the logo is to the right of the signature text block. But in other emails like Outlook and Google, the logo is below the signature text block. Thanks – Can this work with conditional script to handle display/non-display of blank fields? Also – I tried with DIV table statements for responsiveness. And the conclusion isn’t consistent – especially in Outlook. Does Office 365/Exchange work better with tables than DIVs? I don’t think a conditional script will work here. There are scripts available on the web which let you deploy an email signature template to multiple users without displaying blank fields but as far as I know they only work for Outlook. Your best choice might be to use CodeTwo Email Signatures for Office 365: http://www.codetwo.com/email-signatures/beta-signup?sts=3037. It has a feature called the Remove Text tag which does what you want. This is all well and good, but I cant get my signature to work when sending emails from my phone. I am using the outlook app, but the signature that i have set up on the OWA doesn’t get added to emails sent from the phone app. I could add a signature manually to the phone app, however my boss is very particular about the signature being a specific color, font, and size with the company logo in it. It seem like I will not be able to use the app as I would like to. Apologies for the delay responding. My picture goes in the box but I do not see anywhere on my end where I can scale the image size to best fit in. At the moment the picture is 100 times the size of my email but I cannot find the picture of scaling size on step 2 of your instructions. I am using the online office too? Hi Rosie, When you click on picture in the email signature editor, handles should appear around it. You can use them to resize the picture. If this doesn’t work, try resizing the picture in MS Paint (http://www.wikihow.com/Resize-an-Image-in-Microsoft-Paint) and going back to step 1 of my guide. Thanks a lot ! it’s working properly. I can see email signature. I have created an email signature in Microsoft word and it copies fine to the Outlook program on the computer; however, when I copy it to Office 365 online the photos do not show up. How do I fix this? I have spend so many hours trying to figure this out and am just stuck. Any advice that you can give would be greatly appreciated. You might try copying the signature directly from OWA. If this solution does not work for you, you might try using the free Signature Generator to create your signature and then follow the provided steps to add it to OWA.